Walking along the banks of a lagoon is like being on an uncertain boundary line between two worlds: freshwater and saltwater. Along this line the two worlds meet and mingle, creating something unique; a transition environment. In these transitional ecosystems, mostly coastal, there is therefore a mixture of water coming from the sea and continental fresh water, generating an environment of exceptional natural value and interest. Transitional ecosystems are those that due to biotic and abiotic characteristics differ from marine and terrestrial ecosystems. Coastal transitional ecosystems, characterised by brackish water, represent an important and widespread aspect of the Italian panorama. Their waters are defined by the European Water Directive (EU, 2000) as “those bodies of surface water, situated close to river mouths, which are partially saline due to the proximity of the coastal waters, but which are substantially influenced by freshwater flows”. Depending on how they were formed, transitional environments are divided into estuaries, deltas, lagoons and coastal ponds. 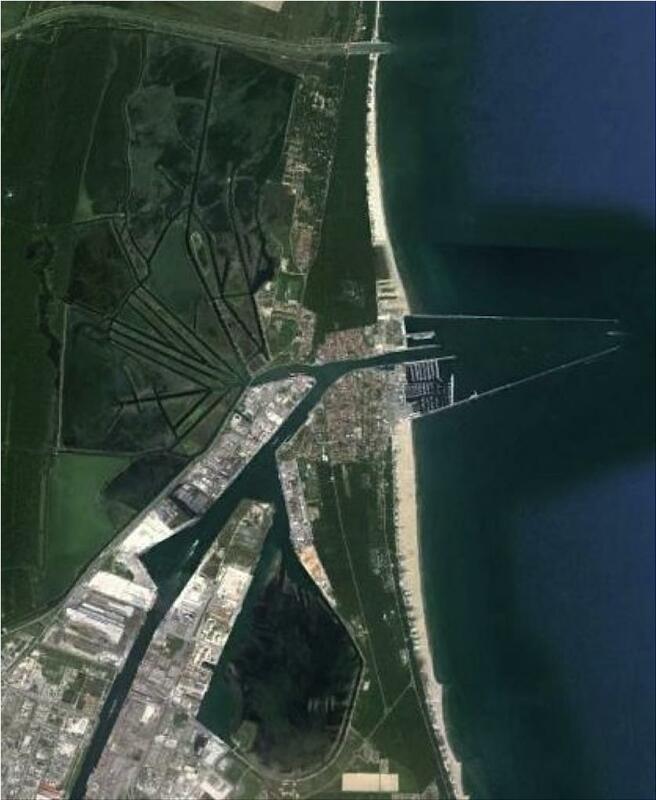 By coastal lagoons is meant coastal areas semi-closed by barriers or peninsulas, generally arranged parallel to the coast, but communicating with the adjacent sea via a canal system and regulated the ebb and flow of the tide. Among these we can mention the famous Lagoon of Venice and the Pialassa della Baiona in the northern Adriatic. Coastal lagoons, and aquatic transitional environments in general, are an important natural heritage. They are ecosystems where the extreme variability of the chemical-physical parameters makes them unique and at the same time vulnerable systems. Salinity increases on approaching access to the sea and, except for remixing phenomena, the heavier seawater is confined to the deeper layers. The changes in salinity and temperature follow seasonal cycles with higher values of both during the summer period due to the increase in solar radiation, higher evaporation rates and lower supplies of fresh water. Lagoon waters, in addition, are also characterised by occasional fluctuations due to atmospheric events, such as storms or rough seas, exacerbated by the reduced depth of these environments (average of around 1 or 2 metres). Oxygen enters the water column thanks hydrodynamism guaranteed by wind and rain. However, the solubility of oxygen in water decreases with increasing temperature and salinity. During the summer there can be a lack of oxygen (hypoxia) in transitional waters on the bottom due to the concatenation of several phenomena: decreased oxygen solubility, stratification of the water which confines the oxygen to the upper layers and high plant biomass (eutrophication) which upon death will be decomposed, consuming oxygen. 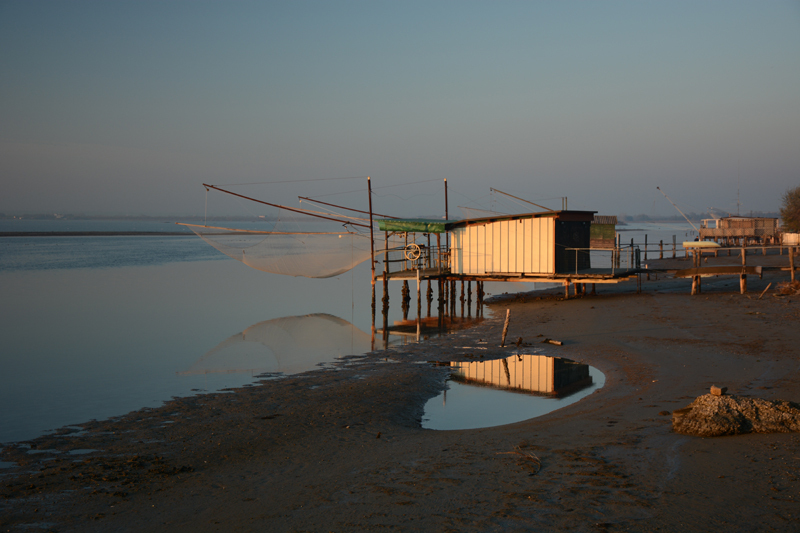 The Pialassa Baiona is a 1000 hectare coastal lagoon located about ten kilometres north-east of Ravenna (Emilia-Romagna). 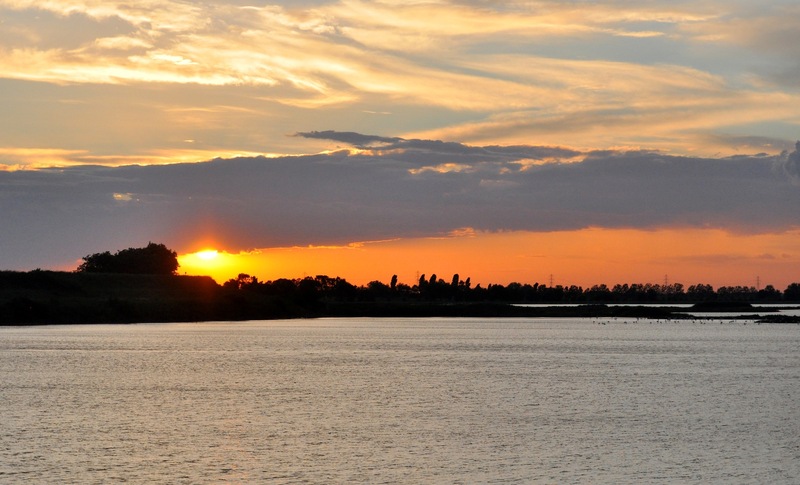 It represents an important natural heritage of the region and is part of the Park of the Po Delta. The etymology of the word “pialassa” comes from a dialect contraction of “takes and leaves,” referring to the water that enters and exits following the tidal cycle. It consists of semi submerged, shallow basin areas called clears. These are interrupted by sandbanks(land which emerges from the lagoon at low tide) or artificial dykes and are fed by main and secondary channels. The clears have a depth of about one metre, while the canals can reach -5 m. The edges and ridges of these basins are dotted with traditional fishing huts, the padelloni (frying pans). The lagoon bed consists mainly of mud and clay. 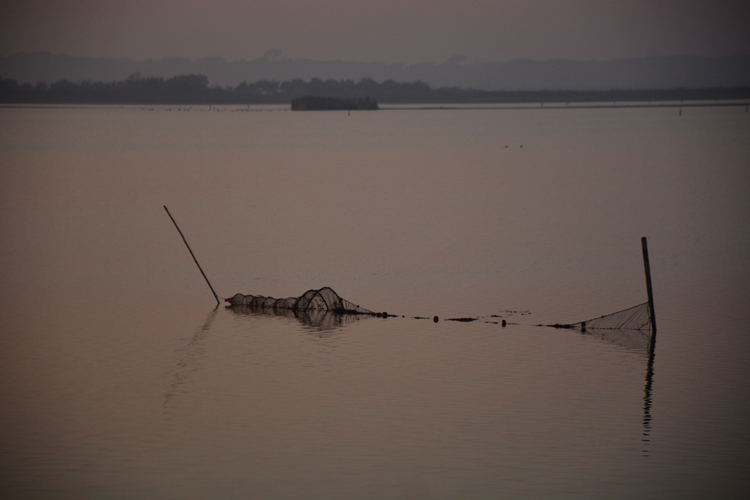 The origin of the Pialassa dates back to the Renaissance period when between the mouth of the Po at Primaro and the delta cusp of Punta Marina there was, instead of the lagoon, a large inlet. Between the 16th and 17th century, periods of heavy rainfall increased the solid load of the rivers. This produced sand bars downstream that modified the coastline. In the following centuries, interventions took place to control the waterways which facilitated the formation of the lagoon; first and foremost, the diversion of the river Lamone to the south. The mouth of the Lamone advanced for kilometres to the south due to the coastal currents and the opening to the sea, originally ten kilometres wide, started to shrink. Over the centuries, many other interventions followed to avert the risk of flooding and to build and then expand the Candiano canal (formerly Corsini quarry port, 1737-47). The valleys were subsequently reclaimed by filling from the late nineteenth century until the mid-nineties. Water circulation was guaranteed by a system of canals that flowed into the main Candiano canal to sea. The Pialassa della Baiona is today a system in continuous evolution, influenced by both natural phenomena and anthropic interventions designed to meet the diverse needs of sustainable land use and nature conservation. 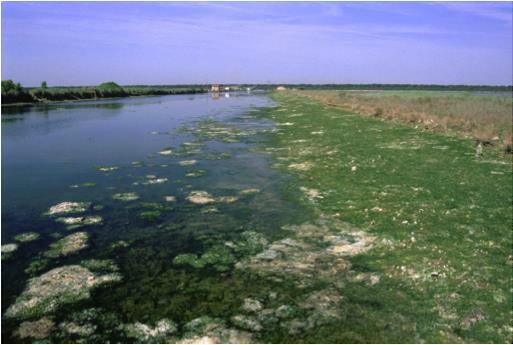 The main production activity in the areas surrounding the Pialassa is agriculture, which is a source of jobs and economic growth, but affects the water quality by generating nitrogenous waste that promotes the growth of nitrophilous algae (eutrophication), animal wastewater and pesticide pollution. 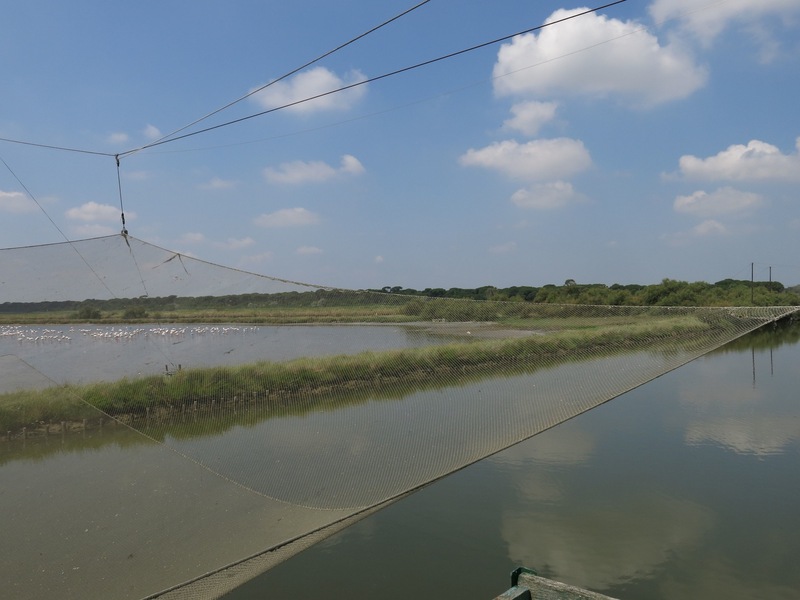 Aquaculture, that can generate a negative impact on the lagoon, such as the immission of non-native species or the administration of drugs, is also practised. Fishing also takes place with the use of the traditional cogollo, a fishing net with a rigid mouth to catch bream, mullet and sea bass, or for small fish, a net is lowered from the huts. Finally, the industrial component, which is only marginally developed at the Pialassa, is an activity that can have an environmental impact. Coastal lagoons, including Pialassa of Baiona, are characterised by the flora and fauna adapted to living in brackish water. Fluctuations, primarily related to salinity, make these stressful environments and organisms, in order to survive and colonize these areas, have developed particular physiological adaptations. Plants found in brackish areas are defined as halophile or salt lovers because they live in highly saline expanses of water. They have developed a set of expedients to survive in these environments. Some aquatic plants have a special fabric, called aerenchima, which carries oxygen to the roots, some have special glands to remove salts, while others can store water in their tissues, taking on a swollen appearance, typical of succulent plants. Terrestrial vegetation plays a key role in terms of stability: it tends to consolidate both submerged as well as emerged sediments. 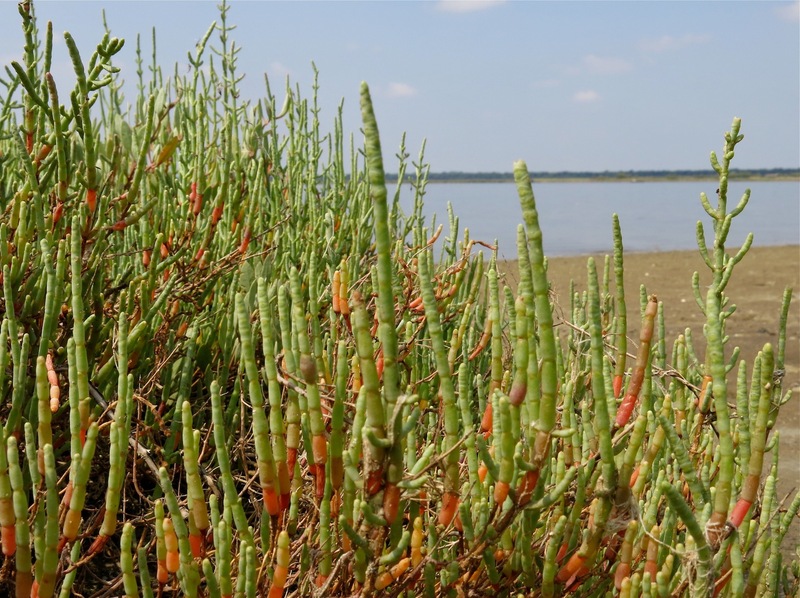 Among the terrestrial species in the Pialassa, worthy of mention is Salicornia veneta, a rare and protected annual species that forms populations which in autumn turn a deep red colour. 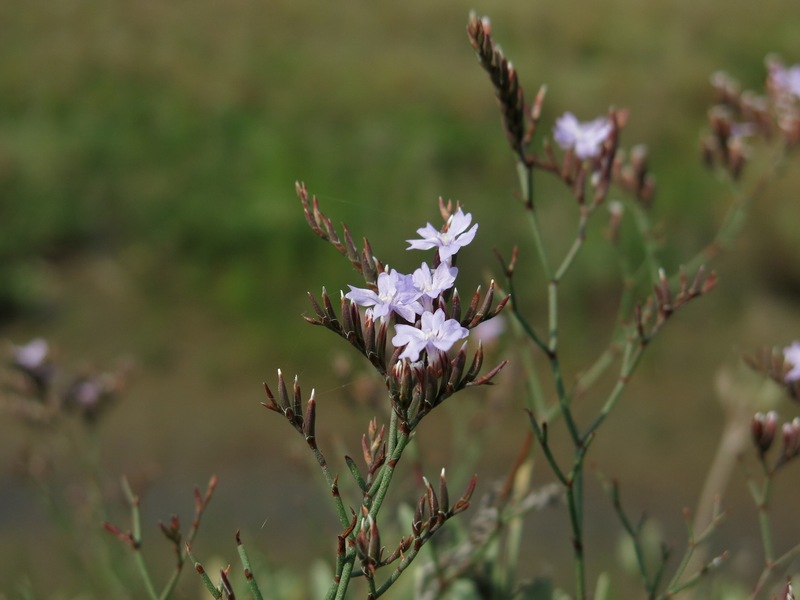 This, together with other species such as the Limonium, forms barenicoli meadows, small depressions partially flooded by the periodical flow of the tides. 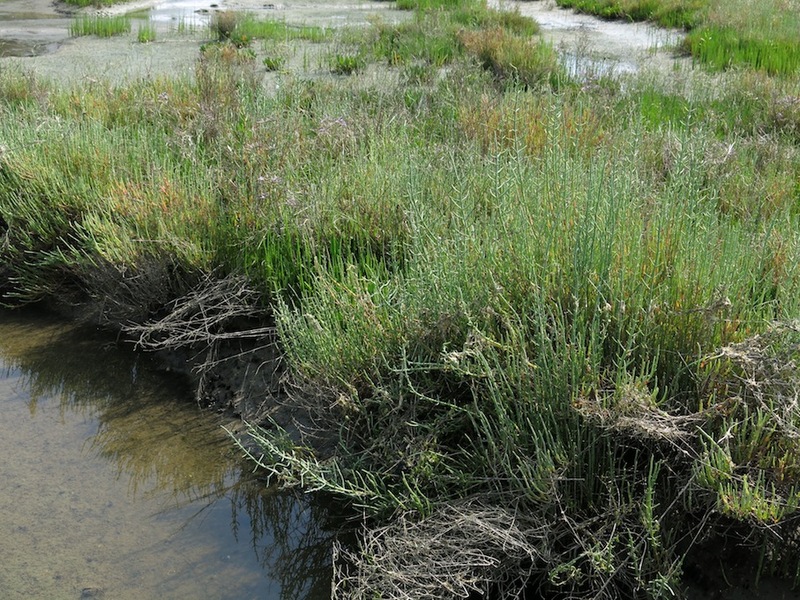 Sometimes the swamp reed, Phragmites australis, is present in areas of lower salinity. Once the stalks were used as insulation for ceilings, to straw chairs or to make brooms. Reed screens were also positioned on the edge of kitchen gardens as protective barriers against the force of the wind. Currently it is transplanted in areas where environmental redevelopment is required. It is also used in the construction of phytotreatment plants. Finally, the dykes are covered with halophile herbaceous vegetation such as Elytrigia atherica and Agropyron pungens. Vegetation provides an important habitat for invertebrates and fish offering areas for breeding, feeding and protection from predation. Green algae are among the most abundant specimens in the Pialassa. They are located mainly in the inland areas and confined to where the water circulation is less and nutrients are abundant. 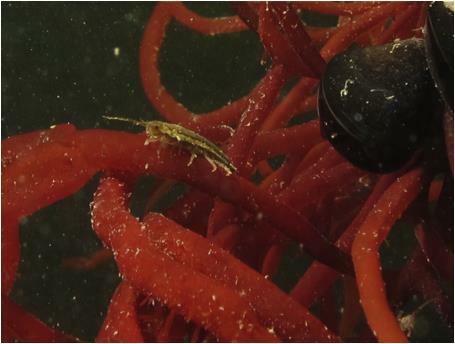 The most common macroalgae belong to the Chaetomorpha and Ulva genera. Ulva laetevirens is often known as sea lettuce because of its morphology and in the summer months often form clumps floating on the water surface. Also red algae, especially of the Gracilaria genus, constitute a large part of the vegetation of these waters. Being sensitive to reduced salinity and increased murkiness, especially the most tolerant species and those able to adapt to the waters rich in nutrients and sediments from rivers are found. They provide shelter and food for small invertebrates. 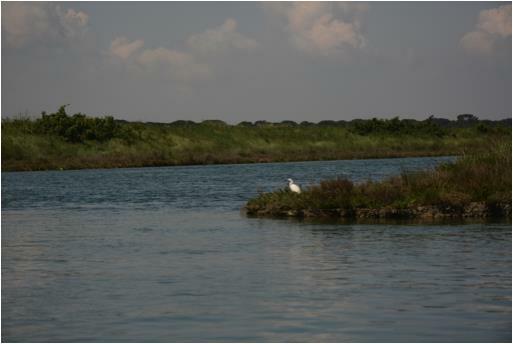 The Pialassa is home to many aquatic birds. 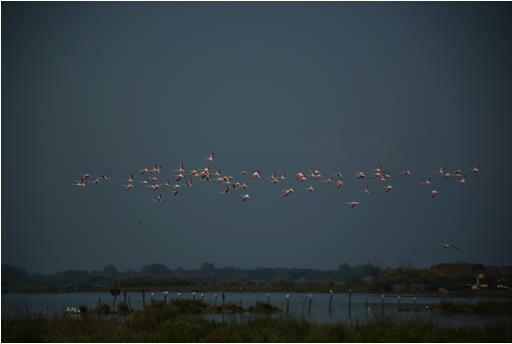 The presence of resident and migratory birds has led to the area being included in the Ramsar Convention (1971) in the list of wetlands of international importance. It represents the ideal place for many species of birds that stop here during migration to rest and eat, but is also used by many species for nesting. In summer there are often large groups of flamingos (several hundred), including the Phoenicopterus roseus, but also other equally fascinating species such as shelducks, avocets, knights of Italy and oystercatchers. The pink flamingo feeds on small invertebrates and algae. Some of these foods are rich in carotenoids, in particular beta carotene, which is deposited in the feathers during development, providing the characteristic pink colour. The significant tidal flow characteristic of pialasses also determines an interesting alternation of species in different places, depending on the time of day. In the benthic area, i.e. in contact with the bottom, it is easy to see in the water, despite their small size, shellfish such as Idotea balthica Errore. L’origine riferimento non è stata trovata.or Gammarus aequicauda. The first is an isopod with small antennas and flattened eyes on the sides of the body. The terminal part of the body has a characteristic three-pronged end, like a brace. G. aequicauda has a laterally compressed body and can reach 1.4 cm in length. 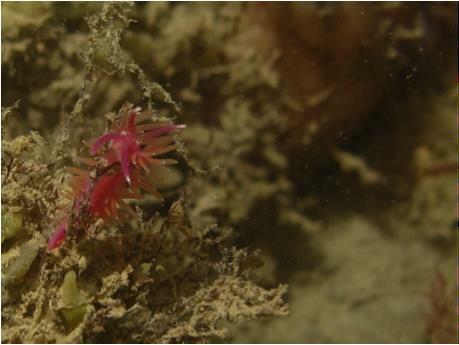 Marine worms such as polychaetes capitellidi, in areas rich in organic matter and poor in oxygen can also be found, among which Capitella capitata and Heteromastus filiformis. Among the molluscs there are many bivalves such as oysters, mussels, clams and nudibranchs, gastropod molluscs often known as sea slugs. In spring, various species, such as flabelline or flaceline, colour the waters of the Baiona. 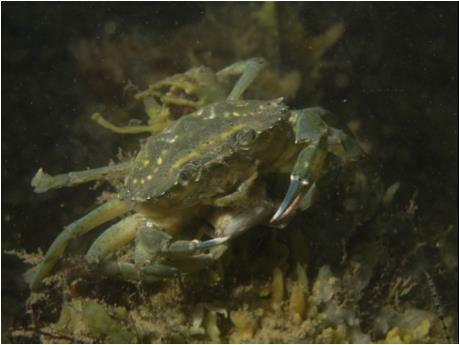 Moving to larger dimensions, the common crab or green crab (Carcinus aestuarii) is a decapod, omnivorous crustacean, typical of transitional waters. It has a remarkable ability to adapt to thermohaline fluctuations. During mutation, losing its carapace, it takes on a tender and soft consistency, which has earned it the name of moeche, a term derived from the Venetian dialect. They are present in Pialassa Baiona but not commercially exploited. Fish are quite diversified with resident species, able to tolerate ample fluctuations in salinity, and species seasonally or occasionally present. In the Pialassa della Baiona it is easy for example to meet the pipefish of the Syngnathus genus. With its characteristic elongated and wiry body, it prefers muddy sandy and bottoms, likes to hide among the aquatic vegetation and feeds on zooplankton through the elongated tubular snout. 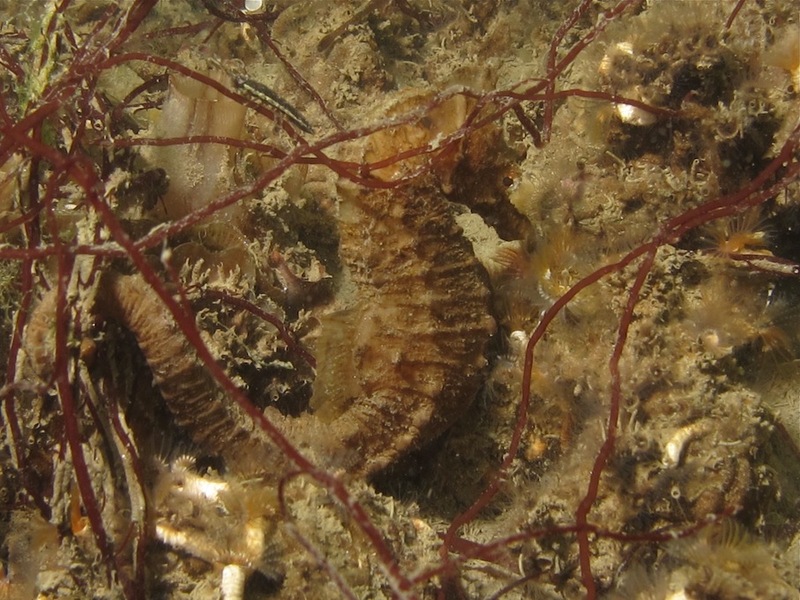 The females, as in the case of the seahorse Hippocampus sp., also present in the Pialassa, lay their fertilised eggs in the incubator pocket of the males. 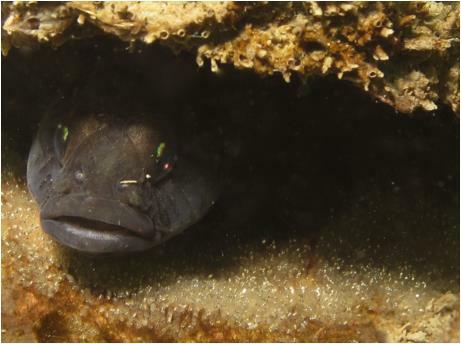 The black goby, Gobius niger, is of various colours, from light brown to black with a bluish hue. It feeds on small fish and benthic invertebrates. The male exercises parental care. The eggs are often laid in dead bivalve shells and the male oxygenates them by moving the pectoral fins. Finally, it is possible to find young forms of several species which find shelter and food in these waters before adulthood. Wetlands are very fragile environments due to the high variability of the chemical and physical parameters, the limited availability of fresh water, water circulation problems and excessive amounts of nitrogen and phosphorus. 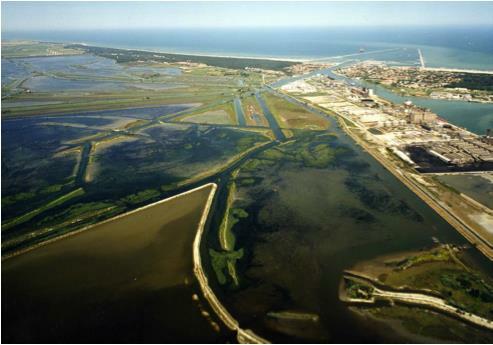 The protection of these habitats through the establishment of parks, such as the Park of the Po Delta, awareness of the local community and constant maintenance works, for example, canals that allow exchange with the sea, are fundamental. Water stagnation would affect its quality, facilitating and intensifying phenomena of hypoxia and anoxia with consequent effects on the habitat (dystrophic crisis) and on biodiversity. 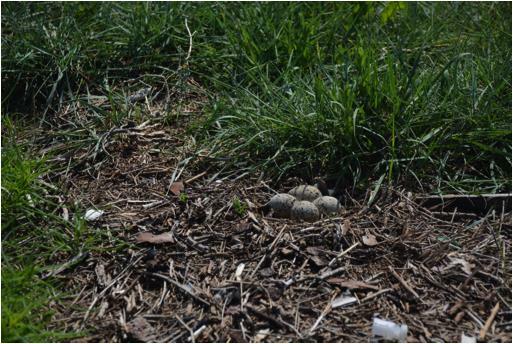 The consequences, for example, can be reflected not only in the water column to the detriment of the species present, but also on bird life, both for the migratory as well as the nesting species, which no longer find food or a habitat suitable for their needs .